Q: I'm a BFU, can you tell me how to install RGTA?! A: So...at first you have to download Final RealGTA3 (107MB) from the download section. Open the downloaded zip file with WinZip and run "finalrealgta3.exe". Follow the installation wizard and then delete the files "txd.img" and "txd.dir" from GTA3 "models" directory (e.g. C:\Games\GTA3\Models). Q: Installation hangs on 60%!!! A: It's not a big deal - JUST WAIT. This may happen to slow computers - just let it install for 10 minutes and it will be ok! Q: I can't see any "txd.img" and "txd.dir"! A: That's ok - if you don't have that files there, that means you haven't run the game yet (=the game hasn't converted the textures to optimal format for your graphic card yet), so you don't have to delete anything! Just run the game and it will be ok! Q: Why I have got white cars??? A: Damn you!!! You are real BFU!!! You haven't read the readme nor followed the installation wizzard, so read the readme (it's also written here 3 paragrapgs above) and complete the installation. Q: When I run gta3.exe, nothing happens!!! A: Ok...the best advice I can give you is to uninstall whole GTA3 (delete the GTA3 directory too! ), then install GTA3, apply GTA3 patch/crack v1.1 and then install RealGTA3 again...and try to run gta3.exe. You don't have to delete "txd.img" and "txd.dir", because you haven't run the game yet. Q: I have successfully launched RGTA, but it crashes after few minutes of playing! A: Take the same advice as in the previous problem. Q: Everything's ok, but when I try to save the game, it crashes! A: You can take the same advice as in the two previous ones, but also you may have a wrong crack, so try some of these (Myth's 1.1 NoCD crack is recommended). Q: I play RGTA smoothly, but when car "x" appears on the screen, game starts to lag! A: This problem may appear on very little number of computers. There were problems with Cooper S, E-Type, SL500 etc. and you can have FPS (frames per second) drops with any other car! But unfortunatelly there's no known certain way to fix it and I don't even know why this is happening. Sometimes re-install fixes it, sometimes re-install just moves lagging to another car. Or you can try to replace that lagging car by another car. Q: The game looks weird - there are missing textures and something doesn't look solid! But after a while, textures appear! A: This is a bug or a "feature" of GTA3 engine and the only way to fight against it is to enable "frame limiter" in display options - this means the game will lock to 30 frames per second (=you won't have more than 30FPS), but it will almost prevent the textures to load so slow. By the way in Vice City it is even worse. Q: My problem is not listed here, what can I do? A: I can help you if you send me an e-mail here. Q: Can I add my own cars to RealGTA3? A: Of course you can...your cars will work well. But don't forget that RGTA changed all configuration files - for example the "vehicles.col" is different, so some of your cars may sparkle on the road. Or some of your cars can have no wheels - RGTA changed "default.ide". It's up to you to add your own cars to RGTA well! This RGTA car list will help you a lot. Q: And what about map-mods? A: You are free to add any map modifications (e.g. Orbital City, Liberty Penitentiary, Stunt Park etc.) except those uncompatible with Liberty Island (e.g. 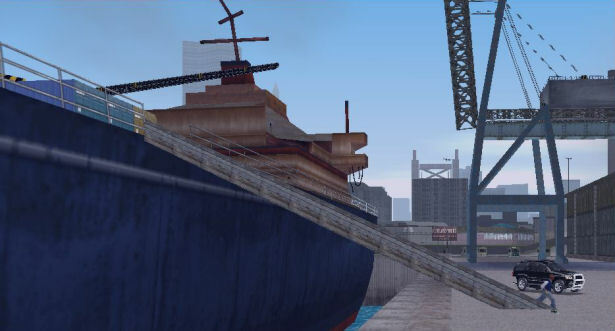 Werre Tower) - you have to delete Liberty Island from "gta3.dat" first before installing those mods! But most of map-mods work well together with Liberty Island. Q: Can I use multiplayer mods with RGTA? A: I'm sorry, I can't answer that, I haven't tested MTA or any other multiplayer mod on RGTA, you have to try it yourself. Original GTA3 needs good hardware - recommended HW configuration is 700 MHz processor, 128MB RAM and 32MB graphic card - but with that configuration you cannot play GTA3 on high details and high resolutions. And if you want to play RGTA smoothly, you need even better hardware! It's hard to say recommended configuration, let's say 1,5GHz processor, 256MB RAM and 64MB graphic card will be ok.
Why RGTA has higher HW requirements? It's simple: average car in GTA3 is made from few hundred polygons and its textures are 50kB big. Average car in RGTA is made from many thousand polygons and its textures are many MBs big. That's a big difference and that's the reason why you have less FPS in RGTA then in GTA3.